The movement of water around, over, and through the Earth is called the water cycle. 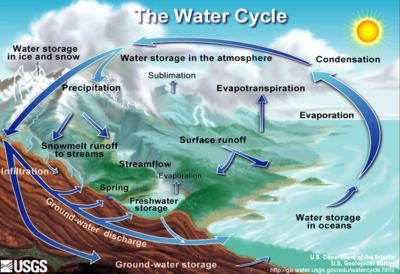 The water cycle, or the hydrologic cycle, is the continuous circulation of water within the Earth's hydrosphere. It involves the movement of water into and out of various reservoirs, including the atmosphere, land, surface water, and groundwater. This cycle is driven by radiation from the Sun. The movement of water within the water cycle is the subject of the field of hydrology. The water moves from one reservoir to another, such as from river to ocean, or from the ocean to the atmosphere, by the physical processes of evaporation, condensation, precipitation, infiltration, runoff, and subsurface flow. In so doing, the water goes through different phases: liquid, solid, and gas. The water cycle also involves the exchange of heat energy, which leads to temperature changes. For instance, in the process of evaporation, water takes up energy from the surroundings and cools the environment. Conversely, in the process of condensation, water releases energy to its surroundings, warming the environment. The water cycle figures significantly in the maintenance of life and ecosystems on Earth. Even as water in each reservoir plays an important role, the water cycle brings added significance to the presence of water on our planet. By transferring water from one reservoir to another, the water cycle purifies water, replenishes the land with freshwater, and transports minerals to different parts of the globe. It is also involved in reshaping the geological features of the Earth, through such processes as erosion and sedimentation. In addition, as the water cycle involves heat exchange, it exerts an influence on climate as well. There is no definable start or finish to the water cycle. Water molecules move continuously among different compartments, or reservoirs, of the Earth's hydrosphere, by different physical processes. Water evaporates from the oceans, forms clouds, which precipitate and the water falls back to Earth. However, water does not necessarily cycle through each compartment in order. Before reaching the ocean, water may have evaporated, condensed, precipitated, and become runoff multiple times. The water cycle is the combination of processes that water goes through in nature. It includes (a) precipitation, which is the falling of water in liquid or solid form to Earth; (b) infiltration, which is the process by which water is absorbed into the soil; (c) surface runoff, in which water flows off the surface; (d) evaporation or transpiration, which occurs when water is heated and vaporizes, or when plants give off water vapor; (e) condensation, which is the process by which water vapor cools and forms clouds. This cycle is repeated over and over again. The major physical processes involved in the water cycle are the evaporation of water from the oceans and land, the transport of water in the atmosphere, condensation, precipitation over the oceans and land, and the flow of water from land to the oceans. 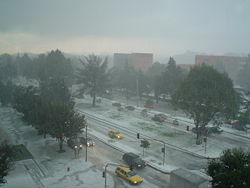 Hailstorms, such as this one in Bogotá, Columbia, are a product of the precipitation process. Evaporation is the transfer of water from bodies of surface water into the atmosphere. This transfer entails a change in the physical nature of water from liquid to gaseous phases. The source of energy is primarily solar radiation. Evaporation is closely related to transpiration from plants, as well as, to a lesser degree, perspiration from land mammals and marsupials. Thus, this transfer is sometimes referred to as evapotranspiration. About 90 percent of atmospheric water comes from evaporation, while the remaining 10 percent is from transpiration. Condensation is the transformation of water vapor to liquid water droplets in the air, producing clouds and fog. Advection is the movement of water—in solid, liquid, or vapor states—through the atmosphere. Without advection, water that evaporated over the oceans could not precipitate over land. Precipitation is water vapor that has condensed into clouds and falls to the Earth's surface. This mostly occurs as rainfall, but also includes snow, hail, fog drip, and sleet. Runoff includes the variety of ways by which water moves across the land. This includes both surface runoff and channel runoff. As it flows, the water may infiltrate into the ground, evaporate into the air, become stored in lakes or reservoirs, or be extracted for agricultural or other human uses. Sublimation is the state change directly from solid water (snow or ice) to water vapor. Canopy interception is the precipitation that is intercepted by plant foliage and eventually evaporates back to the atmosphere rather than falling to the ground. The amount of water that it intercepted depends on the duration of the storm, the windspeed and temperature, and the amount of foliage present. Infiltration is the flow of water on the ground surface into the ground. The speed of infiltration depends on how moist the ground already is, and on its infiltration capacity. Having infiltrated, water comprises soil moisture within the vadose zone, or groundwater in an aquifer. Snowmelt refers to the runoff produced by melting snow. Subsurface flow is the flow of water underground, in the vadose zone and aquifers. Subsurface water may return to the surface (for instance, as a spring or by being pumped) or eventually seep into the oceans. Water returns to the land surface at lower elevation than where it infiltrated, under the force of gravity or gravity-induced pressures. Groundwater tends to move slowly, and is replenished slowly, so it can remain in aquifers for thousands of years. The total amount, or mass, of water in the water cycle remains essentially constant, as does the amount of water in each reservoir of the water cycle. This means that the rate of water added to one reservoir must equal, on average over time, the rate of water leaving the same reservoir. The adjacent table contains the amount of water that falls as precipitation or rises as evaporation, for both the land and oceans. The runoff and groundwater discharge from the land to the oceans is also included. From the law of conservation of mass, whatever water moves into a reservoir, on average, the same volume must leave. For example, 107 thousand cubic kilometers (107 × 10³ km³) of water falls on land each year as precipitation. This is equal to the sum of the evaporation (71 × 10³ km³/year) and runoff (36 × 10³ km³/year) of water from the land. Water that cycles between the land and the atmosphere in a fixed area is referred to as moisture recycling. In the context of the water cycle, a reservoir represents a region or zone where water is stored at a certain stage of the water cycle. The largest reservoir is the collection of oceans, accounting for 97 percent of the Earth's water. The next largest quantity (2 percent) is stored in solid form in the ice caps and glaciers. The water contained within all living organisms represents the smallest reservoir. Freshwater reservoirs, particularly those available for human use, are important water resources. The residence time is a measure of the average time that water will spend in a reservoir. It needs to be understood that some of the water will spend much less time than average, and some, much more. Groundwater can spend over 10,000 years beneath Earth's surface before leaving. Particularly old groundwater is called fossil water. Water stored in the soil remains there very briefly, because it is spread thinly across the Earth, and is readily lost by evaporation, transpiration, stream flow, or groundwater recharge. After evaporating, water remains in the atmosphere for an average of about nine days before condensing and falling to the Earth as precipitation. An alternative method, gaining in popularity particularly for dating groundwater, is the use of isotopic techniques. This is done in the subfield of isotope hydrology. As an example of how the residence time is calculated, consider the oceans. The volume of the oceans is roughly 1,370×106 km³. Precipitation over the oceans is about 0.398×106 km³/year and the flow of water to the oceans from rivers and groundwater is about 0.036×106 km³/year. By dividing the total volume of the oceans by the rate of water added (in units of volume over time), the calculated residence time is 3,200 years—the average time it takes a water molecule that reaches an ocean to evaporate. The water cycle is powered by solar energy. About 86 percent of global evaporation occurs from the oceans, reducing their temperature through the process of evaporation. Without the cooling effect of evaporation, the greenhouse effect would lead to a much higher surface temperature—an estimated 67° C—and a hotter planet . Most of the solar energy warms tropical seas. After evaporating, water vapor rises into the atmosphere and is carried away by winds. Most of the water vapor condenses as rain in what is called the intertropical convergence zone (ITCZ), a low-pressure belt around the equator. This condensation releases latent heat that warms the air. This process, in turn, drives atmospheric circulation. Over the past century, the water cycle has become more intense , as the rates of evaporation and precipitation have increased. It is thought that this is an outcome global warming, as higher temperatures increase the rate of evaporation. Glacial retreat is also an example of a changing water cycle, where the supply of water to glaciers from precipitation cannot keep up with the loss of water from melting and sublimation. Glacial retreat since 1850 has been extensive. The water cycle is a biogeochemical cycle. Other notable cycles are the carbon cycle and nitrogen cycle. As water flows over and beneath the Earth, it picks up and transports soil and other sediment, mineral salt and other dissolved chemicals, and pollutants. The oceans are saline because mineral salts are transported from the land by water runoff, but the salts remain in the oceans when water evaporates. This page was last modified on 11 August 2013, at 21:08.